I grew up in Missouri, home of some amazing barbecue. We have KC Style Barbecue, St. Louis Ribs and we produce a lot of great meat. 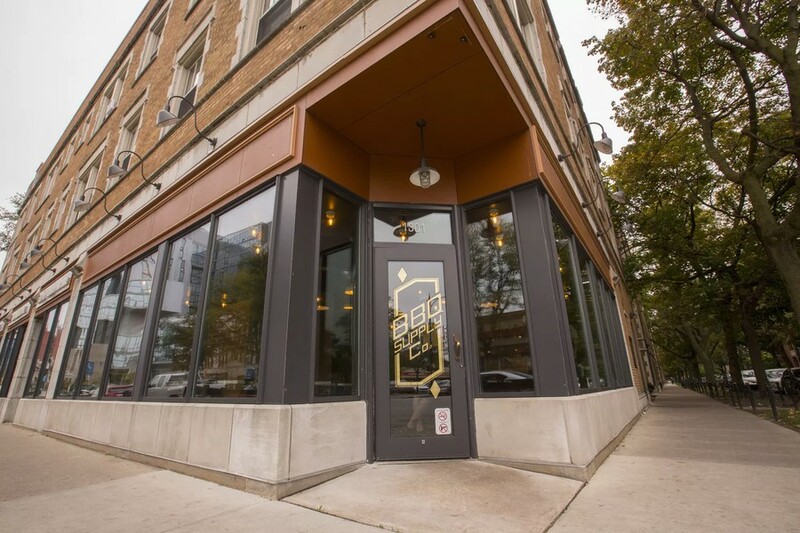 BBQ Supply Co., a Rogers Park restaurant that also offers catering and pit master classes, opened a second branch in Hyde Park last weekend. As soon as I heard, I jumped at the opportunity to try it out. Replacing Yusho on East 53rd Street, the interior of the restaurant pairs a familiar, rustic barbecue feel with a crisp, minimalist flair. The tables mimic butcher-blocks, mixed industrial warehouse lights hang overhead, and tea is served in Mason jars. This modern-meets-industrial style signals a connection to the past of barbecue while recognizing that barbecue is no longer about just any meat on a grill. My friend ordered the shredded chicken while I opted for the two-meat platter with the wagyu brisket and rib tips. However, my dreams of a wagyu brisket were soon crushed as I heard an “86” come out of the kitchen for brisket, meaning they were out. I substituted the brisket for the pulled pork, the backbone of most barbecue places. Soon the food arrived on simple metal trays covered in brown butcher paper. The meats were served with a brioche bun or Texas toast, and on each table, there were four types of barbecue sauces and a jar of homemade pickles. Now let’s put on our bibs and get down to the taste. The rib tips were nice and charred on the outside while still maintaining their succulence. A balanced amount of marbled fat led to a juicy robust flavor. However, the ribs could have had more spices for a punchier flavor profile. The pulled pork was one of the more unusual interpretations of pulled pork I have had. Normally pulled pork is stringy and voluminous, but this dish was denser and arrived as four or five solid chunks of meat. I’m not too much of a barbecue purist, so I was open to this different type of pork. However, I think the entire flavor could have been lifted by a larger surface area to activate more taste buds. Also, this would have allowed the delicious sauces to permeate a little more into the meat. I really liked the thickness and texture present in the Carolina Gold sauce. I thought it was a cohesive acid that activated some of the proteins to release mouthwatering flavors. The menu has surprising depth, ranging from a pulled pork Reuben to a taco with Texas caviar. I would’ve gone for a dinner with some more variety, but the prices were a little prohibitive for sampling a range of dishes. For my two-meat dinner, my friend’s pulled chicken, and an iced tea, the ticket came to $31. While the food was good, the prices might prevent the restaurant from becoming a regular dinner spot for students.